Okay tomorrow is the day. If you have not done anything toward your 1st Quarter Goals, get something done today. You have one day to make at least one goal to come true. I challenge you to decide today to follow the quarter method for your goals. So much can be accomplished in 90 days. If you really want to see MASSIVE change in your life, follow a 90 day goal calendar. Only set goals that you can accomplish is 90 days. This will allow you to reach your major goals without any problem. The first quarter ends on March 31, 2015–today is March 30, 2015, you can have one thing accomplished if you desire it. I can give you a couple of goals to consider: 1. Read 2 chapters of a book; 2. Write 2 chapters of your book; 3. Design a action plan for you business; 4. Exercise for 30 minutes; 5. Write 5 thank you notes; or 6. Connect with 2 people via the telephone. All of these can be a part of a MAJOR transformation in your life. 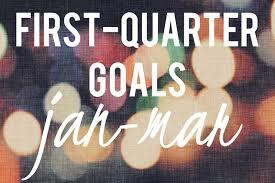 Take the time and set up your 2 quarter goals today, but before you do, FINISH YOUR FIRST QUARTER GOALS.